A ‘PARTICULARLY ROBUST’ meeting between Garret Fitzgerald and Margaret Thatcher led to the Prime Minster declaring that “the Irish don’t like to move” but “they all seem terribly happy to move to Britain”. Thatcher made the comments in a meeting with the Taoiseach at the PM’s country retreat in Chequers in November 1984. The meeting occurred a month after the IRA’s Brighton bombing with a pre-meeting memo prepared for FitzGerald describing Thatcher’s “state of mind” as “unsettled”. “Mrs Thatcher’s state of mind at her preparatory meeting was rather negative. Apparently this is not at all unusual,” the memo adds. The confidential documents from the Department of the Taoiseach have been released under the 30 year rule. They show FitzGerald telling Thatcher that they are both going about the problems in Northern Ireland in a manner that is “too rational”, adding that a more emotional understanding is required. The two leaders were discussing a range of possible constitutional options in Northern Ireland when FitzGerald made reference to the model in Belgium in which the diverse regions co-exist. Thatcher said she’d recently made a trip to a factory in Belfast where Catholic and Protestant employees work together in harmony but when she came both sides erected Tricolours and Union Jacks. Thatcher ruled out what she called a “repartition” to change the dynamics in the north. “History shows that the Irish, whether the Scottish-Irish or the Irish-Irish, don’t like to move. However, they all seem to be terribly happy to move to Britain,” she added. The two-hour meeting focused exclusively on Northern Ireland issues and included a prediction from Thatcher that any kind of Britain-Ireland “joint-authority” over the province would lead to “civil war”. FitzGerald told Thatcher that, for Ireland to drop its constitutional claim to Northern Ireland, a system must be put in place for the Irish Foreign Minister and their UK counterpart to arrive at decisions about Northern Ireland together. The proposal for merely “consultation” was not acceptable, he said. The Unionists would say that you are giving up your constitutional claim but you are coming across the border and don’t really need the claim. That would put us well on the way to civil war. Repeatedly during the course of the meeting, Thatcher compared nationalists in Northern Ireland to other minorities in Europe and was incredulous as to why they should be ensured representation in a devolved Government. 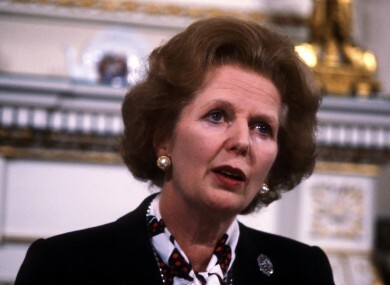 Thatcher said that she “did not understand why a minority sought particular prerogatives” and compared nationalists to other European minorities like Croats and Sudeten Germans who do not have such assurances. But FitzGerald argued that nationalists feel part of the Island of Ireland and had been “cut off by an arbitrary act”. Email “Thatcher in '84: 'The Irish don't like to move, but they're all terribly happy to move to Britain'”. Feedback on “Thatcher in '84: 'The Irish don't like to move, but they're all terribly happy to move to Britain'”.